Solid tan cotton blend suit by J Crew. Rise: 10.5”. Light general wear. Sleeve: 26.5 ”. Waist: 20". Pit-to-Pit: 22”. Inseam (crotch to cuff) 30.00". Waist (laid flat) 18.25". Material: Wool. Pants front: Pleated. Labeled Size: 44 L. Notes: small pinhole on right sleeve of jacket. Sleeve length from shoulder seam: 26". Across waist: 22". Across waist: 18". Inseam length: 30". Inseam (crotch to cuff) 30.00". Waist (laid flat) 18.00". • Size 39R Pants 36/30. Charcoal gray. Material 100% Wool. Sleeve length 23”. Body Length 30”. Shoulder width 19”. Olive Green Brown WOOL. The Suit is in overall Very Good Used Condition with 1 chipped button on cuff. Jacket has 3 external pockets, 3 internal pocket 4 buttons on each sleeve Single Rear Vent. Inseam (crotch to cuff) 30.25" (1.125" to let out). Waist (laid flat) 18.00". Inseam (crotch to cuff) 29.50". Waist (laid flat) 18.00". Pants Size: 36W 30L. Jacket Size: 44R. CALVIN KLEIN. Style: Wool Blend Slim Fit - 2PC Suit. If there is any problem with your item(s), we will take care of you, we promise, but we do need you to let us know. Shoulder (seam to seam) 17.75". Waist (laid flat) 18.00". Front Rise (waist to crotch). Inseam (crotch to cuff) 29.50" (1.25" to let out). Chest (pit to pit) 21.00". This is a fine full suit from the more recent Canali Brown Label Collection. Made in Italy. Suit is made of a light weight (four season) cloth. Cloth is labeled as 100% wool. Cloth color is a solid dark gray. Material: Cotton blend (64% cotton, 33% Nylon, 3% Polyrethane) see the picture for more information. Labeled Size: 46 Jacket. Pants front: Flat. Labeled Size: 36 pants. Sleeve length from shoulder seam: 25.5”. Jacket Size 42L. Other Details: Ron Ross, Pleated Pants. Pant Size 36x30. Material Rayon & Wool. Pattern Solid. Across Waist (Laying Flat) 21.5. Color Black. Number of Buttons: 2. 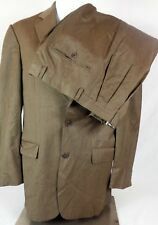 Hickey By Hickey Freeman Suit Size 42L 100% Worsted Wool Tan Plain NWT $895 "NY"
100% Authentic Hickey By Hickey Freeman 2 Peace Suit, 100% Worsted Wool, Tan Color, Solid Pattern. Dual Vent, 2 Button Style, 4 Button Cuff. Jacket Size: 42L. Manufacturer: Hickey Freeman. Collection: Hickey Freeman. Recent Ralph Lauren Black Label Black 2 Button Suit Size 40 R. Black Label is the modern fashion forward line comparable to the more traditional Purple Label. Wool is smooth. Fabric Composition: 100% Wool. "ALAN FLUSSER". Inseam 30"Cuffed. ICan be lengthened to: 32.5" Not Cuffed. 55% LINEN 45% RAYON. Previously owned clothing may have been tailored to fit and new clothing designers do not use universal sizing. : William Fioravanti. Color : Charcoal Black. Design: Solid. What good is a great deal if it's on a knockoff?. Three Exterior Pockets. Double Pleats. Two Button Single Breasted. Two Interior Pockets. Color : Dark Navy Blue. Three Button Single Breasted. Four Interior Pockets. Four Working Buttons on the cuffs. Three Exterior Pockets. What good is a great deal if it's on a knockoff?. Maybe you're not a millionaire, but at least you can be just as well-dressed. Two Piece Slim Fit Suit. Jacket: Two Button, Fully Lined, Double Side Vent. Pants: Flat Front, Straight Leg. Length (Top of Collar to Hem): 27”. In Seam: 32”. Waist Of Jacket (Across Upper Button): 36”. Excellent condition. 100% wool. I believe the jacket is based on the Madison Fit. Jacket with no vent, fully lined. Tag Size : Jacket 42R , 36 X 30" pants Please carefully check measurements as every brands have slight differences in their sizing approach. Measurements (lying flat, unstretched) : Jacket Shoulder to Shoulder - 21" Underarm to Underarm - 23" Waist Just above Pocket - 21.5" Sleeves (shoulder seam to cuff) - 25.5"( 1" to let out) Length (center seem from bottom of collar to hem) - 31" Pants Pleated Front with cuffed hem. Waist - 18" (36" around) Front Rise : 13" Inseam - 30.5" ( 2" to let out) Leg opening - 9" Condition: New without tags. Pockets still sewn shut. Smoke-free and pet-free environment. Color: Slate Blue. NewSTEVE HARVEY SUIT. JACKET : 2 Button Single Breasted, Besom Pockets with ticket Pocket, Breast pocket. Light Weight Fabric 83 % Polyester / 17% Rayon. 36 38 40 42 44 46 48 50 52 54 56 58 60.